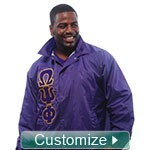 "...EXTREMELY SATISFIED AND HAPPY WITH MY ORDER..."
"I just received my order for my nephews Alpha Phi Alpha Fraternity Line Jacket and I am EXTREMELY SATISFIED AND HAPPY WITH MY ORDER. I pledged Alpha Kappa Alpha 16 years ago and I already have a Line Jacket, however I will be ordering a revamped Line Jacket for myself from your company. Great job on the detail and the Jacket was made exactly like I asked for in the proof design process. I will definitely spread the word to others about your company. Thank you and I look forward to working with you again."